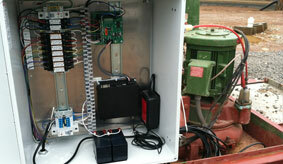 The PSP (Pump Station Pilot) is a unit that can combine two very important parts of any pump station operation. It can remotely monitor your station so that you know what is going on seven days a week twenty four hours a day. It can also be used as a primary or secondary pump controller. It therefore allows you to start or stop your pumps from any internet enabled device, including smartphones and tablets. The PSP can track everything that goes on at your station including but not limited to pump starts and stops, pump run times wet well levels, and flow trends. The unit comes standard with 8 inputs that can be any combination of analogs, digital, or pulse type inputs. 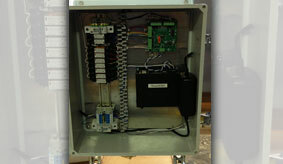 The unit comes completely preconfigured so that all you do in the field is mount it then hook it up and go. Units can be customized for any particular system requirements. Configuration is done via an internal software PLC that you do not have to be an engineer or know anything about ladder logic to be able to make changes. TNTs PSP will watch your stations for you so you don't have to worry about it during rain events or at any other time either. If an event happens that you want to be notified of it will send out an sms message or an email or both to how ever many people you designate. Matt Shields - Superintendent, Rural Membership Water Corp.